[Editor’s note: In 1864 John White, a merchant of Warrenton, NC, was sent abroad by authority of the NC Legislature and Governor Zubulon B. Vance to buy supplies for the NC State Troops during the American Civil War. 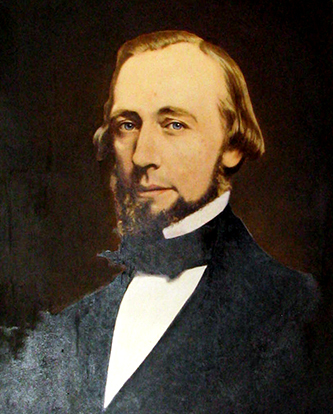 He planned to take his family with him through the Federal Blockade at Wilmington on board the state-owned blockade runner, Advance, in August, 1864. The following was extracted from a diary by John White’s daughter, Mary J. (age 15, born July 21, 1849). It portrays the difficulties they and others encountered in attempting to run in and out of the federal blockade of Wilmington. It’s highly recommended that you read the following book excerpt (link) written about Mary White’s diary. It’s a well written narrative inspired by Mary J. White’s diary. It describes well the cultural and social anxieties of 1864 in Wilmington and Smithville. Tuesday, Aug. 2, 1864 – I left our home in Warrenton, NC for England with Father, Mother, Bro. Andrew, Hugh, Kate and Sue. Father had to go to buy supplies for the NC Soldiers, and things were so awful here and Mother and he suffered so much being separated and our baby sister Lizzie died while he was away, so he promised Mother he would never leave her again. . . . It all seems very strange, but we are going with Father and I hope everything will be all right. Aug. 8, 1864 – We left Raleigh, Friday the 5th, for Wilmington, where we arrived safely the same night about 10:00 o’clock. . . . We left there Saturday morning for the S.S. Ad-Vance, which was lying in the Cape Fear River, near Wilmington. We expected to run the blockade that night, but there was some mistake in the ship’s papers and before they could be corrected, we were too late for the tide and had to cast anchor and lie there all night. Our family and Dr. Boykin’s went ashore and spent the night. Mr. Parsley said we shouldn’t try the poor hotel accommodations, so we went to his house and spent the night there and started again the next morning about 8:00 for our ship. . . .
We passed Forts Fisher and Caswell and all went well for a time but finally went aground. . . . Not far behind us is the Mary Celestia from Bermuda, in quarantine. It is reported that the yellow fever is in Bermuda and a man died on the Mary Celestia this morning, it is thought from yellow fever. There is also an ironclad to our right. We passed a good many obstructions in the river, that were put there for the purpose of entangling the Yankees, if they should try to go to Wilmington. The Little Hattie went out the first night that we intended to go. . . . The Helen, which had been lying near us all day, went out, and as no guns were heard and no news from the ship, it is supposed that she escaped uninjured. Today, three more cases of yellow fever were reported on the Mary Celestia. Aug. 9, 1864 – It is thought, as we did not get out last night, we will try once more tonight, but this will certainly be the last time. Last night the Annie came safely from Bermuda and is now in sight of us. We saw a small boat carrying a coffin to the yellow fever boat, so another of the poor fellows must have perished. . . . The Ad-Vance is a very fine steamer, 235 ft. in length, 22 ft. in width, a very fast ship and successful blockade runner. It was fitted up splendidly, for passengers, before it was put to its present use and was named the Lord Clyde. The saloon was removed and cotton bales put in instead and the accommodations for ladies are very poor. Aug. 10, 1864 – on board the Ad-Vance. 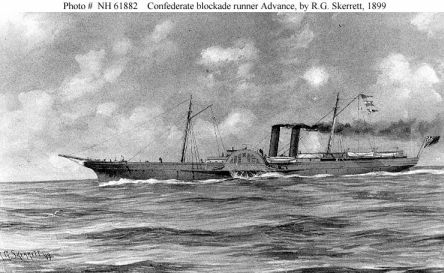 Last night, we made a last effort to run the blockade and were over the rip, and it was thought that we would get out without much difficulty, but they did not steer properly and we missed the channel and fastened in the sand. Aug. 12, 1864 – Wilmington, NC. Yesterday morning about twelve o’clock, we got off the sand bar and came back to Wilmington. All the passengers came ashore, our family to Mr. Parsley’s again. This morning at 9:00 we expect to go to Smithville with Dr. Boykin’s family, to stay until the Ad-Vance sails. Smithville is a small village on the Cape Fear River, about 30 miles below Wilmington. . . . The house we are staying in belongs to a family named Cowan. . . . It is a very comfortable house with six rather small rooms and three piazzas. . . . The City of Petersburg came in today. Aug. 14, 1864 – Smithville, NC. Father and Capt. Wylie have just left for Wilmington. Father expects to go home to Warrenton before he returns. He expects to be back the last of next week.